Meet Mary-Margaret Bennett, a third-year Management student majoring in Entrepreneurship and Innovation. She is currently the Vice President of Marketing at Enactus Dalhousie and an Assistant Career and Recruitment Specialist at Management Career Services. 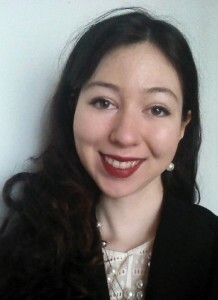 She has work experience in business development and public relations and has numerous community involvements. Mary-Margaret was impressed by the Bachelor of Management Internship Program initial info sessions and resources she was given. She feels that the hands-on learning and networking opportunities have offered her a wealth of knowledge and have relevant application to her job search and student society work. “It is never too early to begin preparations for the job search. Making valuable connections now and maintaining them will create a competitive advantage over other candidates. Try out safe environments for pitching practice: there are numerous events held by the city and local organizations that are completely free for students to attend, so students should seek them out online or in the MCS weekly newsletter. The next person you shake hands with might be your next employer! I also recommend using all of the resources that MCS provides. Applying to the Internship Program, going to employer information sessions, and building your Co-Curricular Record are manageable goals that bring you closer to finding a job, and look incredibly attractive on your resume and transcript. Mary-Margaret would like to thank the Internship Program and the passionate MCS team who have helped her to realize her potential and move closer to completing her goals. The deadline to apply to the Bachelor of Management Internship Program is January 31, 2016. Visit the MCS website for more information. This fall, Management Career Services is reaching out to our Dal alumni network to offer our current students a chance to connect and learn from alumni. We are doing this through an ‘alumni – student mock networking event’ on Wednesday, Oct. 21, 2015. Students within the Bachelor of Management program can complete a course preparing them for an optional internship (8 months – 16 months). An element of this course involves teaching students how to professionally network and build relationships. Our ‘mock networking event’ will enable students to practice their networking skills with alumni who can provide a safe and welcoming professional environment. Our students will have just completed their classroom exercises on networking and will be eager (and perhaps a bit nervous) to put their new skills to use. 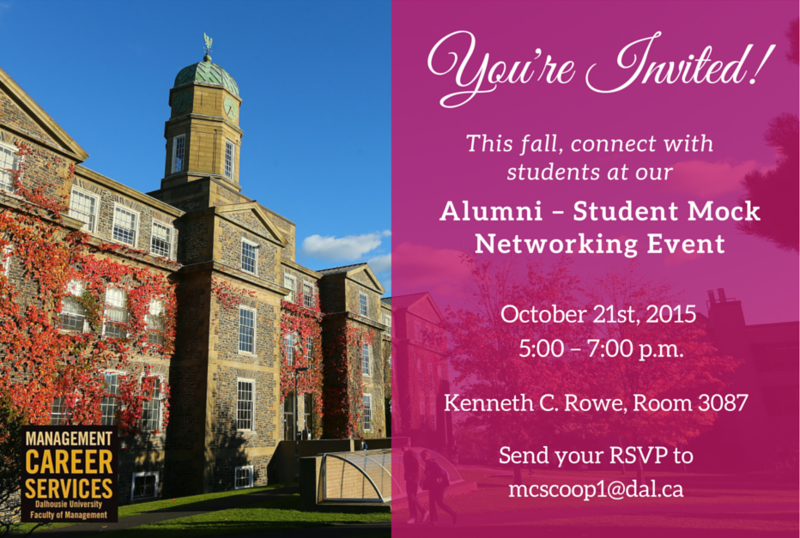 We hope that you can join us, as a Dal alumnus, to help our students learn how to network! Full event and RSVP details captured in the invite below. “Although my current position is not in the public sector I still draw on things every day that I learned during my internship. This includes time management skills, communicating with both co-workers and customers, and technical skills. I’m not disappointed at all that my current job is not in the public sector because the professional skills I learned while on my internship are only going to advance my career no matter what industry I choose to work in. I find the public sector interesting, but I also enjoy the position I have at Cargill. If I could go back, I do wouldn’t change a thing. Visit the Bachelor of Management Internship program website for more information on how you can get involved with the program. The application deadline for the 2015 Internship Program is Thursday, January 29th! Looking for career advice? Book an appointment with your Career and Recruitment Specialist through myCareer.